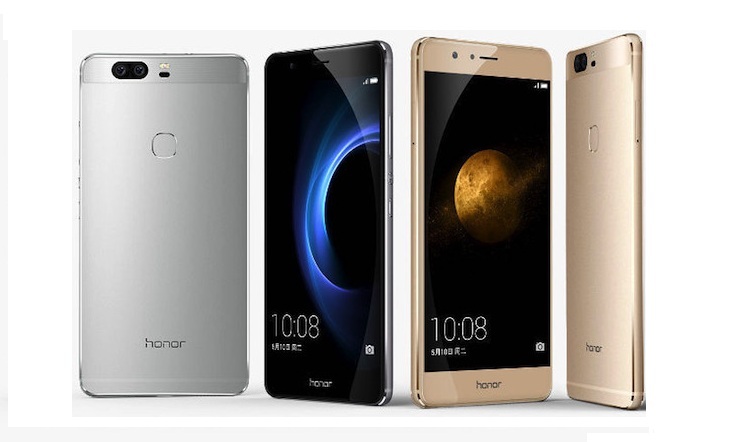 Huawei has showcased its Honor V8 at an event in China. The Huawei Honor V8 comes with a Dual 12 MP Rear camera with Laser auto focus. Talking about the specs, It comes with an Octa Core Kirin 950 CPU, 4 GB Ram, and a 5.7 Inch Full HD display with 32 GB variant. Whereas the 64 GB variant sports a Quad HD display. The Huawei Honor V8 sports a decent 3500 mAh battery. The USB is taken care by a TYPE C port which supports fast battery charging. In terms of design it has a metal uni body design with 2.5 D glass on top (i.e. on screen). The rear camera is a 8 MP f/2.4 aperture) sensor. 5.7 Inch Full HD (~386 p.p.i pixel density) Display with 32 GB Variant. Whereas 5.7 Inch Quad H.D (~515 p.p.i pixel density) display with 64 GB Variant. (~490 p.p.i pixel density) Both Comes with 2.5 D Glass on top. Octa Core Kirin 950 CPU. Dual 12 MP (f/2.2 aperture) Rear camera with Laser Auto focus. 8 MP (f/2.4 aperture) Front camera with Full HD video recording support. 32/64 GB internal storage options. Expandable up to 128 GB via Micro SD card. (Using SIM slot 2). CPU/GPU Octa-core. (2.3 GHz Quad Core Cortex A-72 & 1.8 GHz Quad Core Cortex A-53). Kirin 950 CPU. | GPU Mali T 880 MP-4. DISPLAY: 32 GB Model: 5.7 Inch Full HD. Resolution 1080 x 1920 pixels. (~386 p.p.i pixel density). 64 GB Model: 5.7 Inch Quad HD. Resolution 1440 x 2560 pixels. (~515 p.p.i pixel density). CAMERA REAR: Dual 12 MP (f/2.2 aperture). Resolution 4128 x 3096 pixels. With Laser auto focus, and dual-LED flash. | Features: Touch focus, face detection, panorama, H.D.R, Geo-tagging. | Video Features: 2160 p@30 fps, 1080 p @60 fps, H.D.R recording | FRONT/SELFIE CAMERA 8 MP 1080 p.
BATTERY Non-removable Li-Po 3500 m.Ah. SENSORS Fingerprint, Accelerometer, proximity, gyro, compass. CONNECTIVITY Bluetooth v 4.2. | W.I-F.I 802.11 a/b/g/n/AC, Dual Band, W.I-F.I Direct, DLNA, Hot spot. | Dual SIM (GSM) Size Micro SIM & Nano SIM. The 32 GB Variant with Full HD display and No NFC is priced at 2,299 Yuan in China. (Around 350$ i.e. Equivalent of 23,390 Rupees in India). Where as the top variant with 64 GB Storage and Quad HD display & NFC is priced at 2,799 Yuan. (Around 439$ i.e. Equivalent of 29,250 Rupees in India). It is currently available in China. Unfortunately there is no official info about its price & availability in India as of now. But we can expect it to price around 23490 Rupees for basic model. whereas the top variant will cost around 29,890 Rupees in India.